ABC News Watch: Mt Everest melting! But who says it's so? Apparently no-one! Mt Everest melting! But who says it's so? Apparently no-one! ABC Audience and consumer affairs provide the following reply in regard to a complaint about its report "Melting ice making Everest climbs dangerous". Thank you for your further emails of 3 and 9 August. 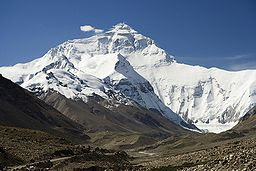 As previously advised, the ABC sourced the report it published as 'Melting ice making Everest climbs dangerous' from the BBC as part of an established agency arrangement. When your complaint was received, Audience and Consumer Affairs considered whether a significant error had been made which warranted correction. We noted that table 10.2 of the Contribution of Working Group II to the Fourth Assessment Report of the Intergovernmental Panel on Climate Change 2007 did appear to show temperatures rising faster at Mount Everest than in the rest of South Asia. (Ed. unfortunately it didn't - see HERE and HERE and HERE) We do not claim that this was the source relied upon by the BBC in their original story. We have noted the material you have provided questioning the veracity of a statement in the report (HERE). Since we have not been able to verify a source for the references to climate, and in view of the brevity and overall focus of the item, we have removed these references from the story and added an Editor's Note to this effect. The editorial note reads "Editor's note (September 1, 2010): A reference to studies of climate in the Himalayas has been removed from this story because the ABC was not able to verify its source." Without a credible, verifiable source this story amounted to unsubstantiated rumour, and now without the climate aspect it is hardly newsworthy and probably should have been left in the editor's bin. If only ABC News had spent a small amount of time checking its sources before getting carried away with unsubstantiated claims of climate alarm, ABC's audience would not have been mislead. We have yet to receive a response from the BBC. We thank ABC Audience and Consumer affairs for taking the time to properly investigate this matter. See also Himalayan warming – pulling another thread from IPCC’s fragile tapestry. June 4 Mt Everest melting! But who says it's so? August 4 Update: Mt Everest melting! But who says it's so? August 9 Update 2: Mt Everest melting! But who says it's so? Excellent work! Keep pressing the BBC for a response. "As previously advised, the ABC sourced the report it published as 'Melting ice making Everest climbs dangerous' from the BBC as part of an established agency arrangement." My advice would be to scrap the "agency arrangement". The BBC does not publish facts, but selective opinions to further its left wing ideas. 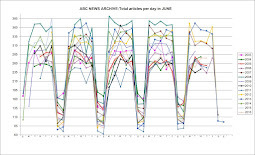 Rely on the BBC for climate change information at your peril. The BBC decided that man made global warming was such a done deal that they decided not to allow any sceptics air time. The BBC takes editorial lines on virtually everything, almost without fail from the left wing intelligentsia viewpoint. It is supposed to be "impartial". To me that is tell both sides and leave the viewer listener to make his own mind up. What is more we have to fund this via a television tax. If you want to watch television you have to pay for BBCs take on everything!